Yesterday, MSNBC announced that they were moving Ed Schultz’s The Ed Show back from its weekend exile to the 5pm weekday slot. The announcement took a lot of people by surprise, although the motivation for it has been known for a long time: the show that took Ed’s old 8pm M-F slot has been struggling in the ratings. MSNBC had made a classic media move — replacing an older anchor with a fresh face — but this time it didn’t work out as planned. Fortunately for Ed, his fans moved with him to his weekend slots. 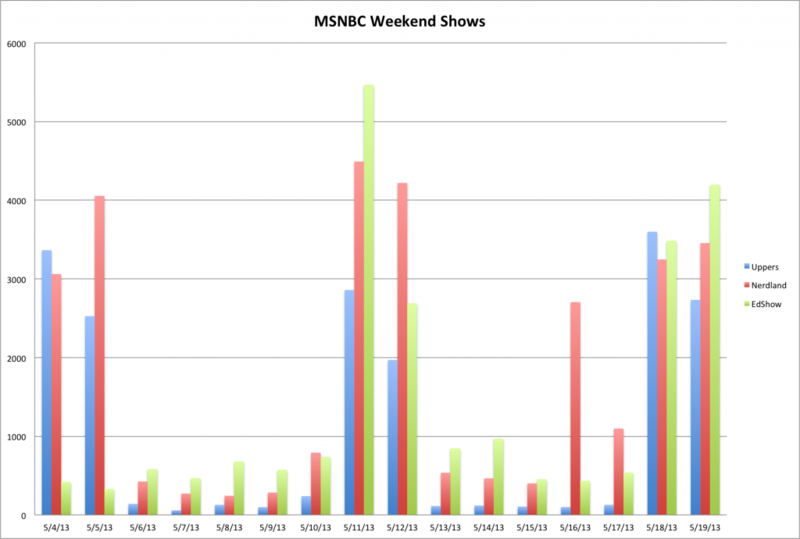 Almost immediately he was more popular on Twitter than the other MSNBC weekend shows. That fan base is who’s carrying Ed back to primetime. Back in March it was announced that Ed Schultz’s MSNBC show would move to the weekends, and almost immediately he was disappeared1 from the airwaves to be replaced by Chris Hayes’s All In show. But something odd happened — his weekend reboot didn’t happen, and the timing of it became murkier and murkier. Many of us wondered if there was going to be a re-launch at all. But May 11th saw his return to TV at the 5pm weekend time slot. The long absence led a lot of us to wonder: Would Ed’s audience return to him now? How would that time slot work? Good news: it looks like Ed is back in his groove and, judging by his Twitter engagement, he’s audience is with him. 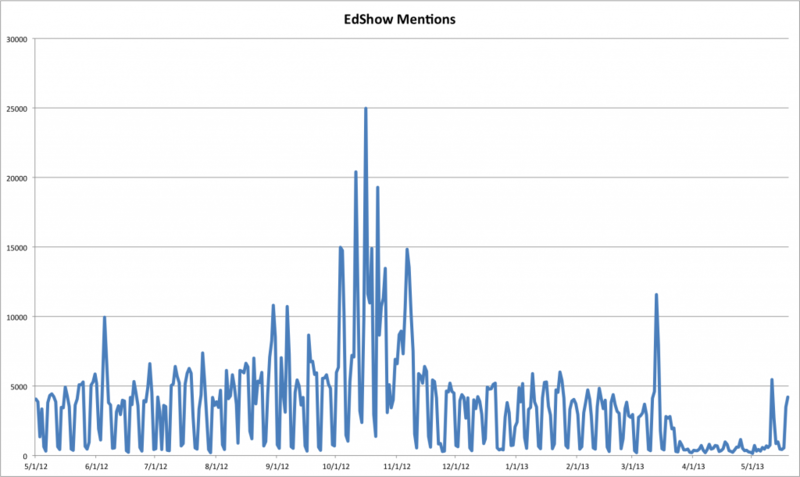 The chart shows discussion of The Ed Show on Twitter over the past year, and you can see that the past two weekends have hit levels on a par with Ed’s engagement during the span of his daily weekday show. Glad to see Ed’s gotten back to work! The announcement over a week ago that Ed Schultz would be moving his show to weekends came as a bit of a shock, especially since he did one more show before departing the airwaves. It seemed hasty and poorly planned, without a really good (or believable) explanation for what happened or an actual date of when the weekend show will start beyond “April” (for those of us in the software business, a mention of just a month for a target date instinctively produces the cynical response “of which year?”). Click on image to make it as big as Ed’s heart! The real winner of the Wisconsin recall: Walker? Romney? 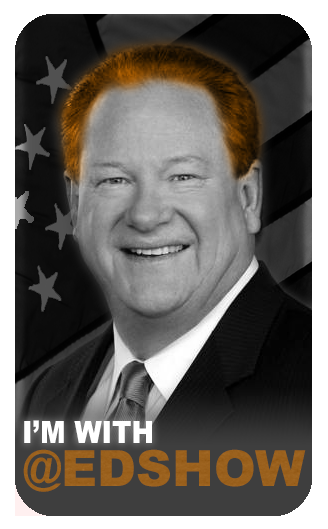 How about Ed Schultz! The failed Wisconsin recall a week ago (6/5) generated a lot of conventional wisdom: Scott Walker renewed his mandate, the unions lost, and a new dynamic was introduced into the presidential campaign that helped the Romney campaign. And from a media perspective, Fox News was crowned the winner while MSNBC and, in particular, Ed Schultz were the grieving losers. The mood around MSNBC that night and the next day bore witness to the disappointment of the MSNBC hosts. Pundits — conservative and liberal — mocked MSNBC’s seemingly all-in bet on the recall. Despite their disappointment being palpable, it does not mean that MSNBC “lost”. MSNBC is not in the business of getting democrats elected (as much as it may seem to be the case); MSNBC is in the business of selling its viewers to advertisers. 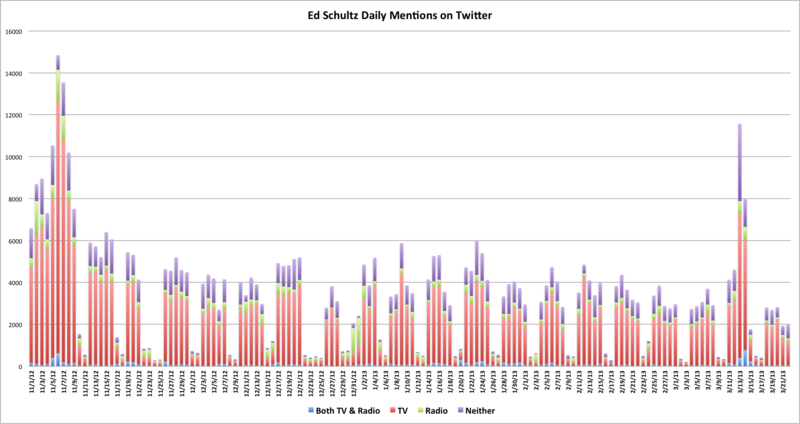 When you look at it from the perspective of ratings and social media, the night becomes a win for Ed Schultz. Bill O’Reilly and Ed Schultz go head to head at the 8pm time slot on Fox News and MSNBC. Earlier, I covered the relative twitter activity of Maddow vs. Hannity, and we saw how Sean Hannity’s followers were much more active on Twitter than Rachel Maddow’s. 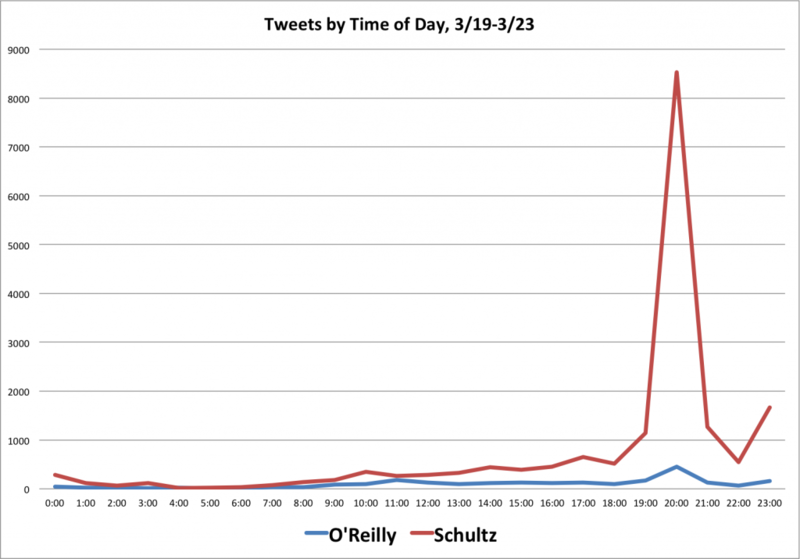 I thought it would interesting to take a quick look at Bill O’Reilly vs. Ed Schultz. Ed implores his viewers to tweet him in a poll every day, and so I was curious if that produced a greater response. Ed’s commanding lead in tweets comes purely from the engagement he generates from his audience during the show (the show is also on at 11pm ET, which generates a second spike towards the very end of the day). So the winner in this Tweetdown is Ed Schultz! Bill O’Reilly: Why not engage your viewers on twitter? Ask them to tweet you what they think of a topic each night and we’ll have a rematch! 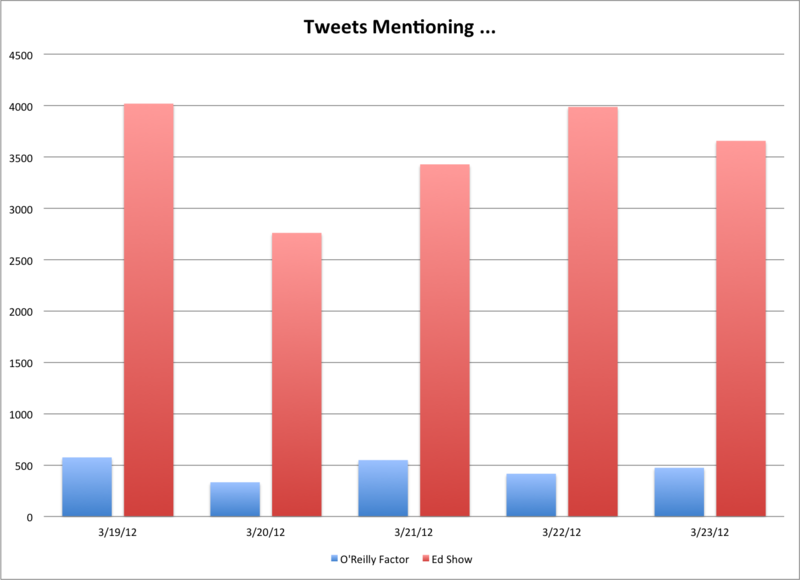 Methodology: I looked at all tweets from 00:00 on Monday to 23:40 on Friday that had either @oreillyfactor for Bill or @edshow OR #edshow for Ed.